Double The Fun! 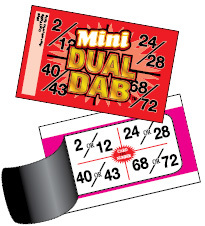 Mini Dual Dab is a 4 number ticket with a twist. If a player has either called number in a square, the square gets marked giving the player 2 chances to win! Mini Dual Dab is a fast game that’s great for early birds or specials. It can also be played along with a jackpot or special game, letting you offer an extra prize. 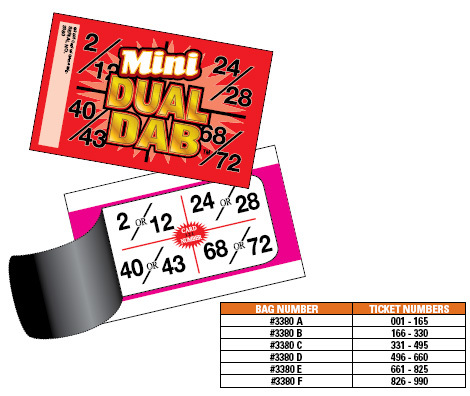 Mini Dual Dab comes in 6 deals of 165 tickets that can be played separately or combined when more tickets are needed. Each set of tickets has a unique serial number and is offered in 6 different tag colours (red, blue, green, orange, purple & black), making it easy for you to play and track Mini Dual Dab several times in a session.